New York City and Oxford are two prominent examples of local authorities that have tried to restrict the use of foam packaging for takeaway food and drink, arguing that doing so would reduce the environmental impact of waste in a way that alternative approaches could not. In both cases, the intervention of packaging manufacturers has lifted or watered down the rules. Other administrations might well be put off the idea of similar measures – but the argument for cracking down on foam packaging that almost unavoidably gives rise to regional waste management problems, as well as wider environmental degradation through its contribution to litter, remains hard to ignore. Bans, however, may not be the only option. A particular target for action has been expanded polystyrene (EPS). It’s rigid and a good insulator, and yet a great deal of it is air, making it very lightweight: it’s little wonder that EPS trays, cups and ‘clamshells’ are staples of the industry. It’s also widely used in pre-moulded form in the packaging of electronics, and as loose fill packaging in the form of ‘peanuts’. While no-one would deny its convenience, for waste managers, EPS is a challenge, for many of the same reasons that it is popular. It’s light and difficult to compact, so it fills up bins and collection vehicles quickly; and takes up a great deal of space if you try to bulk and haul it for recycling. It’s easy to see, then, why in 2013 New York City’s council voted unanimously to prohibit the use of EPS by all restaurants, food carts, and stores. Yet from the outset, the ban proposal faced stiff opposition from retailers and manufacturers, with packaging giant Dart Container Corp. and the American Chemistry Council reportedly organising a million dollars’ worth of lobbying against the legislation. Once it took effect, the industry quickly managed to overturn it in the courts last month. The city had found that the recycling of EPS was not, in fact, environmentally effective, economically feasible and safe, and NYC was declared EPS-free in July 2015. But in a widely reported ruling, Justice Margaret Chan deemed the decision “arbitrary and capricious”: the complex case turned on the question of whether there was a recycling market for EPS, and the judge decided that Commissioner Kathryn Garcia of the city’s Department of Sanitation had failed to take account of evidence supplied by the industry that such a market did exist. Although it lacked the courtroom drama of the New York City case, a similar story played out in Oxford last year. The city council proposed to use its licensing powers to require street traders to use only “biodegradable and recyclable” packaging and utensils. The move was stymied by semantics: the Foodservice Packaging Association lobbied for the phrasing of the proposed licensing rule to be amended to ‘biodegradable or recyclable’. 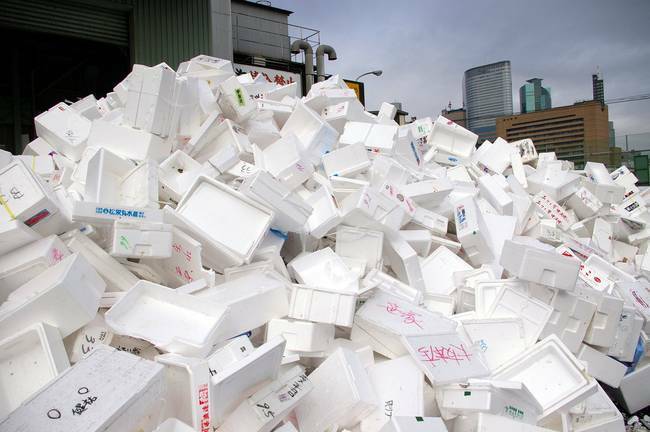 That tiny change allowed continued use of expanded polystyrene, as it is technically recyclable (though certainly not biodegradable). Oxford’s traders are also required to arrange for the correct disposal of EPS takeaway packaging from their premises. This is an odd requirement given that take-away food is usually – well – taken away, and then disposed of in street bins, household bins, or in no bin at all. Unfortunately, Oxford City Council – like almost every other council in the country – isn’t currently able to send EPS for recycling, so the EPS it collects will in practice end up in the residual stream. The EPS litter that escapes will linger in the environment for centuries to come. It seems that both courts and councillors have been impressed by the manufacturers’ argument: ‘Why ban a highly efficient product when you can invest in recycling it instead?’ However, there are three important points that count against this contention. The first is that, whilst EPS can technically be recycled, the economics of doing so remain tenuous. Zero Waste Scotland’s report on Plastic Recycling Business Opportunities found that polystyrene waste compacting and collection was the only one of five options considered that did not represent a viable business opportunity in Scotland. In order to make the finances of collecting EPS for recycling stack up in New York, Dart Corporation and Plastics Recycling Inc. had to offer to provide the city with $500,000 of sorting technology; pay for four staff; and guarantee to buy the material at $160 per tonne for five years. Without this (time limited) largesse, New York’s ban would likely have stood. They also provided a list of 21 buyers, who they claimed would purchase dirty EPS – although when the city did a market test, it could find no realistic market for the material. It’s hard to know whose view of the US market is correct; however, in the UK, the market is definitely weak. Of the 34 EPS recyclers listed by the BPF Expanded Polystyrene Group, 12 only accept clean EPS – ruling out post-consumer fast food waste. Another dozen will only accept compacted EPS, creating an extra processing cost for anyone attempting to separate EPS for recycling. That leaves a maximum of ten UK outlets: not enough to handle the potential supply, and leaving large tracts of the country out of economic haulage range for such a bulky, lightweight material. The second is that it’s difficult to get a high percentage of takeaway food containers into the recycling stream. Food eaten on the go is likely, at best, to go into a litter bin. And if it’s littered, because it’s light, EPS can also easily be blown around the streets, contributing to urban, riverine and ultimately marine litter. It’s also very slow to break down in the natural environment. Polystyrene has been found to make up 8% of marine litter washed up on North East Atlantic beaches; in all, plastics account for three quarters of this litter. The cost, particularly for coastal and island nations, is only beginning to be recognised. The economic and technical difficulty in recycling EPS, combined with the long-term impacts of its littering and disposal, led Michelle Rose Rubio to conclude, in an Isonomia article last year, that environmentally minded people – and perhaps governments – should perhaps avoid it altogether. Despite the discouraging events in New York and Oxford, there’s better news from elsewhere. Bans remain in place in Toronto and Paris (both dating from 2007), while Muntinlupa in the Philippines, and the coastal state of Malaka in Malaysia have imposed charges, fines, and biodegradable replacements for EPS food packaging, eventually leading to bans. In Wales, a polystyrene ban petition lodged last year by Friends of Barry Beaches has been picking up support. The Foodservice Packaging Association’s pre-emptive opposition to the notion certainly suggests we haven’t heard the last of EPS food packaging bans in the UK. However, bans are not the only way to deter the use of problem products. England has just joined the ranks of countries to impose a charge for single use plastic bags. Belgium has a tax on disposable cutlery, and Malta taxes numerous products on environmental grounds, including chewing gum and EPS clamshells. Whilst beyond the powers of local authorities, fiscal measures could drive change while being a bit less of a blunt instrument than a ban. While EPS manufacturers may have scored some recent successes, they haven’t won the overarching argument. As we push towards a more circular economy, the pressure to reduce our reliance on materials that are inherently hard to recycle, which tend to escape into the environment, and which don’t decompose naturally, will grow. For EPS fast food packaging, the chips could soon be well and truly down. Note: This article is being republished with the permission of our collaborative partner Isonomia. The original article can be found at this link. Ayesha J. Bapasola is a Junior Environmental Consultant at Eunomia Research & Consulting. She joined the company’s Bristol office as part of the Economics and Policy team in 2014, having completed her MSc in Environmental Economics, focussing on valuation and appraisal techniques, as well as sustainable planning and policy review. Ayesha provides technical support to the delivery of a range of projects, and is responsible for generating high quality research and reports for clients in both the private and public sectors. Most recently, her work has focussed on a review of recent changes to the economic landscape of biomass for electricity in key EU Member States, as well as several research tasks to support DG Environment’s review of waste targets. Tagged environment, EPS, Fast Food, Foam Packaging, Litter, Malaka, New York, Oxford, Paris, Recycling, Restaurants, Takeaway, Toronto. Bookmark the permalink. Solar or wind or sea energy add find cheap aid, providing discontinous use of nearby availability during idle times. Not a large spot, but opportunities of use as much as there are markets for food and varieties of packaging waste! All together. It might have sense. The idea came out by a senior chem engineer migrated to France with his family from the Hungarian repression imposed by the relevant policies, lasting from 23 October until 10 November 1956. It was object of a patent, not exploited in continental Europe, largely considered by Japanese industry interested to apply appropriate large mixers sizes to comply road constructions technologies… during the ’70s. The original patent claims were relevant for the expoitation of unwashed sea sands and the destination of thermoplastic polymers (inclusive of u-PVC), which were economic competitors free delivered to the spot as is at the collection, without the preliminary need to invest for selection and contamination risks. Try and create on the spot! It’s easy to mix the wide variety of plastic to sand ratios with any heat available to soften the polymers ligand with the fillers… until an acceptable degree of dispersion!